Beginning with the Green Revolution of the 1960's, Pakistan has made remarkable strides in feeding a population that today is quickly approaching the 200 million mark, making it the fifth-largest nation in the world. Despite its limited resources, Pakistan's agricultural sector and the institutions assisting its management, such as the Pakistan Agricultural Research Council (PARC), have continued to promote sustainable and progressive agricultural initiatives that have yielded fructiferous success. The weather paradigm in Pakistan's Potohar region has historically been influenced by copious rainfall in short periods, most notably in the monsoon season, which produces large fluxes of runoff waters that must be conserved and efficiently utilized in order to ensure food security. Previously, the Government of Pakistan had invested heavily in the region in order to promote sustainable usage of the rainwater systems, but these initiatives had fallen short of the targets set by the government for mitigating population pressures in a region with more than 10 million inhabitants. Improper Watershed management, conventional energy scarcity, and irrelevancy of conventional irrigation practices (such as flooding) were considered major constraints for agricultural expansion in the Potohar region. To combat the effects of food scarcity, sporadic rainfall, and the ever-increasing demands of a growing population on the agricultural systems of the Potohar region, the Pakistan Agricultural Research Council (PARC) spearheaded a new model for sustainable Mini-Dam development, the Solar-powered Irrigation System (SPIS), which rested on the implementation of a Solar-powered pumping system and its integration with High Efficiency Irrigation technologies, including Drip-based and Sprinkler-based water transfer modules. The new irrigation mechanism was implemented over a sizeable scale of approximately 20 acres, and sought to demonstrate a series of integrated agricultural practices unified by a sustainable system, including: agro-forestry, pisciculture, seasonal vegetable cultivation, tunnel farming, and orchard arboriculture. In addition to improving the productive yield of the region, the SPIS also had minimal operational costs due to its renewable-energy construction, thereby concurrently minimizing the environmental impact whilst improving the fertility of the land. It is for this duality of benefits that the work of the PARC deserves recognition: by promoting sustainability as well as productivity, the PARC has exemplified the exigencies of development in our times, and provided an impressive solution thereto. On the site in Fatehjang where the system was developed, the previous use of the area involved merely low-scale fish-farming, while the command area of the terrain was not benefitting from stored water, in large part due to the absence of a cheap or renewable energy source to transfer the water. In fact, the previous farmers at the site had implemented a lift-based irrigation system, but dismantled it soon after due to the high fuel costs of running it. To address this energy cost issue, a solar-energy pumping system of 5000 Watts with a submersible pump was designed and installed at the site. This device lifted water out of the local reservoir (a Mini-dam) and fed it to an overhead tank of 700 cubic feet which was 35 feet in elevation above the reservoir's surface. This overhead tank was then used to gravitate irrigation water through a drip system which efficiently transferred water to 1.2 acres of orchard. 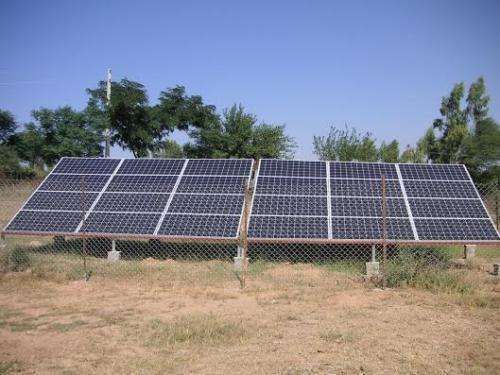 An additional 10 acres of land was brought under efficient cultivation using solar operated portable sprinklers, which transferred water to erstwhile barren soil in a manner which optimized surface area and water use considerations. 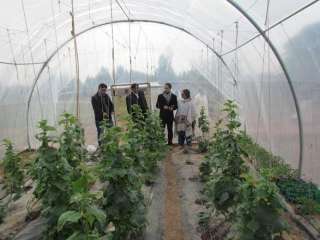 Various vegetable types were grown adjacent to one another via a tunnel farming mechanism which addressed the specific water needs of every plant at minimal operation costs. To account for the management of watersheds, the naturally sloping land of the site was developed by breaking and dividing land slopes with plantations established using micro-catchment based in-situ water harvestings. The supplemental irrigation for this aspect was also ensured through the solar pumping system. Furthermore, check-damming, terrace developments, land covering with field crops, agro-forestry enhancements, biological wind breakers, and the construction of energy dissipating structures were all introduced to improve soil conservation. These Best Management Practices (BMPs) helped to create a sustainable and productive agricultural microsystem at the Fatehjang site. As it is very important for the maintenance of the solar panel to regularly clean them and eliminate dust (which can reduce photovoltaic efficiency by 30%), the washing of the solar panels was assumed by a sprinkler device that was integrated into the irrigation system, thereby creating even greater efficiencies within the operational framework of the SPIS. Furthermore, for the fisheries that were already in place when the Fatehjang site was transferred to the PARC, the SPIS was used to improve even the aquaculture productivity of the area, by introducing an innovative mechanism of aeration for the fisheries through the very same sprinkler system powered by the solar-energy based water pump. Therefore, the PARC used its technology in a manner that was harmonious with existing practices on the site, and infused their erstwhile inefficient management with a sustainable new approach. In sum, the environmentally friendly SPIS model introduced by the PARC demonstrated the potential for sustainable technologies in intensifying high-value agriculture in the Potohar region of Pakistan to ensure food security and rural livelihood improvement. An agricultural system with minimal operation cost and virtually no climate impact was introduced which showed the ingenuity of sustainable technological solutions. Of greater import, this project can be considered for implementation across the entirety of the Potohar region and other similar ecological areas within Pakistan, thereby addressing the food security concerns of one of the largest and fastest-growing populations in the world. As such, this project embodies the beauty of discovering sustainable and creative solutions for the growing complexity of alimentary requirements around the world, and gives new life to the optimism that sustainable solutions are at the heart of our efforts to satiate our developmental needs whilst minimizing our ecological footprint in the years to come.